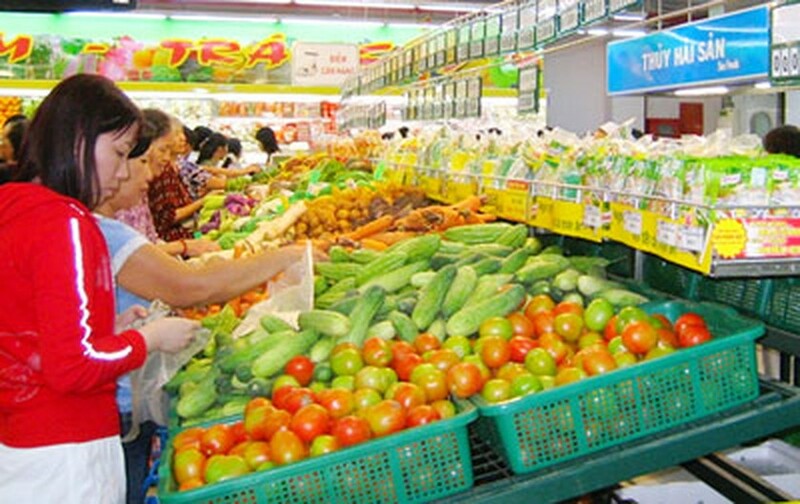 Provincial Agricultural Departments throughout the country confirm that supermarkets under the City price subsidized program have increased the volume of essential goods to meet the increasing demand ahead of Tet Lunar New Year. At present, vegetable production in the country covers 830,000ha, supplying nearly 14 million tons of vegetables, in which the northern area grows 380.000ha, producing approximately 6 million tons, said Le Quoc Doanh, head of the Department of Crop Production under the Ministry of Agriculture and Rural Development. To further ascertain, the Department of Crop Production under the Ministry of Agriculture and Rural Development sent three teams to inspect the production of vegetables in the localities. In case the Northern region faces a shortage of vegetables the Ministry will transfer vegetables from the South to the North, Doanh stated. Meanwhile the Co.opMart supermarket chain in provinces has increased stockpiles by four times compared to normal months to ensure an adequate supply during the Tet holidays. Co.opMart supermarket has stocked 11,000 tons of rice, 3,800 tons of sugar, 4,400 tons of cooking oil, 5,100 tons of meat, 2,370 tons of poultry meat, 2,250 tons of processed foods, 9 million eggs and 490 tons of seafood. Besides essential items that are sold at 10 percent lower than market price under the City price subsidized program, Saigon Co-op will slash prices by an additional 10-50 percent on selected items. The supermarket chain also plans to organize at least 150 mobile stores to the City’s remote districts as well as industrial parks and export processing zones. Similarly, Big C supermarket chain has increased supplies by 15 percent compared to last year and offering a discount of upto 50 percent on nearly 3,000 Tet products from February 2. Big C and Co.opMart are improving home-delivery services and increasing the number of staff to meet consumer demand. Both chains are preparing an increased number of Tet gift baskets, with most of the items made in Vietnam. Many electronic shops in HCMC, including Nguyen Kim, Thien Hoa and Cho Lon, are offering attractive discounts on TVs, cameras, mobile phones and electronic household appliances during the Tet festive season.